She turned out to be a rare combination of beautiful and bombastic, starring in a string of popular screw-ball comedies that made everyone fall in love with her – including screen icon Clark Gable. 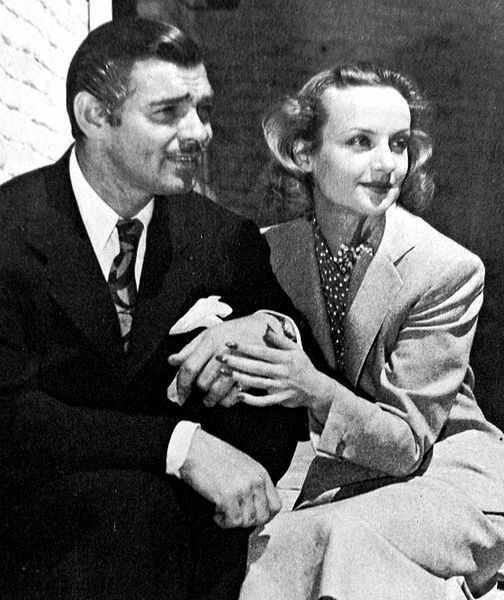 The pair ultimately eloped on March 28, 1939 – a day that Gable had off from filming “Gone with the Wind.” Always openly affectionate and calling each other cutesy nicknames like “Ma” and “Pa,” those who knew the couple said they had never seen either of them happier. After Pearl Harbor, Carole wanted to contribute to the war effort in some way. Her husband was president of the Hollywood Victory Committee, so he arranged for Carole to visit Indianapolis for a war bond tour. Her mother and Clark’s publicist and pal Otto Winkler would tag along for the trip. Before leaving, she gave their secretary Jean Garceau a stack of notes for Clark, instructing her to give him one daily in her absence. Shortly after take off, the plane went off course. There are several theories why. One is that warning beacons had been blacked out because of the threat of a Japanese attack, and this may have been the cause of the aircraft crashing into Mount Potosi. Others purport that the star-struck pilot left an inexperienced co-pilot at the helm so he could talk to his famous passenger. There’s no way to know for sure. What’s certain is that the plane violently collided with a cliff near the top of Mount Potosi, creating an explosion that could be seen two miles away. All of the 22 people on board perished. When Clark was finally told the horrible news, he broke down and cried. After visiting the sight of the accident, he flew back to Los Angeles with the remains of his mother-in-law, his best friend, and his soul-mate. At his wife’s small funeral, he wore sunglasses and didn’t say a word. That evening, Jean Garceau gave him the final note in the series that Carole had written for him before leaving for Indianapolis. Clarke read it, and broke down. He never shared with anyone the contents of that note. On February 15, 1942, Gable enlisted in the Army Air Forces, a move that his now deceased wife had been pushing for before her death. After serving for three years, he returned to Hollywood and continued making movies, and remarried twice. But friends said he was never really the same after losing Carole, and when he passed away in 1960, he chose to be buried next Carole Lombard Gable.